$4.174 million on -unknown- screens. In 2008, Martin McDonagh made his feature-length film debut with In Bruges. That movie earned fine notices and got McDonagh an Oscar nomination for his script. Buoyed by that, he returns with another off-kilter crime film, 2012’s Seven Psychopaths. Set in LA, Marty (Colin Farrell) works as a struggling screenwriter who tries to finish a script called Seven Psychopaths. Marty finds himself stuck and wastes time with his dog-kidnapper pal Billy (Sam Rockwell). Eventually Billy and his partner Hans (Christopher Walken) steal the wrong pooch, as they make off with Bonny, a Shih Tzu owned by psychologically unbalanced gangster Charlie (Woody Harrelson). This leads to plenty of potential danger as Charlie seeks his dog – and revenge on those who took Bonny. Marty finds himself involved as well, and he might just get good material for his movie – if he survives the experience. Based on the film’s trailers, one might expect a wild, bloody Tarantino-style romp from Psychopaths. While some of those elements do emerge – especially the gore and violence – the film lacks the consistent sense of semi-parody and “B”-movie influence that one gets from Tarantino; while infused with black comedy, Psychopaths tends toward a more subdued, character-based feel. I’m tempted to refer to Psychopaths as a “love it or hate it” flick, but in truth, my feelings end up somewhere in the middle. While I find much to enjoy here, it lacks consistency and feels too disjointed for me to truly embrace it. One gets the impression that McDonagh really, really liked Adaptation. Ala that effort, Psychopaths takes a meta approach, with the sense of a film within a film; it’s essentially about the creation of a flick that we watch as it’s created, or something like that. A screenwriter named Martin wrote/directed a movie about a screenwriter named Martin who wants to make a movie that involves a screenwriter named Martin. Got that? Despite that self-referential-to-the-nth-degree premise, Psychopaths manages to hold together reasonably well. Actually, it’s not quite as aggressively self-conscious as my description might imply, though it teeters on the border of collapse at almost all times. When one wants to make a movie that reflects on movies, there’s always a difficult bargain at work, but Psychopaths manages to remain entertaining despite its potential pitfalls. Unfortunately, all that “meta” does tend to be a drawback, especially as the story grows more and more complex. McDonagh boxes himself into so many corners that he can’t quite figure out how to extricate himself at the end, so he goes the cop-out route and kills almost everyone. Is this a self-aware embrace of clichés or just the simplest way to wrap up the flick? You’ll have to decide that for yourself, but I lean toward the latter explanation. All of this leaves us with a sporadically clever and involving movie but not a consistently satisfying one. As it attempts to mock and upend genre stereotypes, Psychopaths fails to come up with anything better to offer in their place. A strong cast helps ground the flick, and it throws enough at the wall that some of it sticks, but I can’t call this a movie that delivers a fulfilling experience. 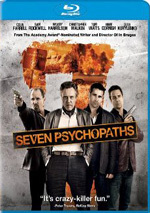 Seven Psychopaths appears in an aspect ratio of approximately 2.40:1 on this Blu-Ray Disc. I found no problems with this positive presentation. The flick went with a fairly warm palette. It favored a mild amber tint that worked within the theme and context, though it’d also tend toward some greens, reds or blues when appropriate. Brighter hues looked good, and overall color balance appeared positive. Blacks were dark and tight, while shadows showed nice clarity. Sharpness seemed fine, as overall definition was strong and no signs of softness materialized. Jaggies and shimmering were absent, and edge haloes weren’t a factor. No signs of source flaws emerged. Across the board, this was a pleasing transfer. As for the DTS-HD MA 5.1 soundtrack of Psychopaths, it worked fine for the material. At no point did it threaten to dazzle, though. The track stayed with general ambience most of the time. 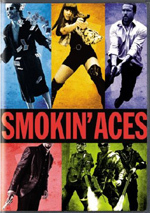 It kicked into higher gear during the action sequences, as it went with the usual pyro associated with those kinds of flicks. These gave the project good impact when necessary and used the five speakers in a satisfying way. Audio quality always seemed fine. Speech came across as concise and well-defined, without edginess or other issues. Music showed nice range and vivacity as well. Effects displayed accurate tones and presented good heft when appropriate. Nothing here really excelled, but the package seemed positive enough for a “B”. Most of the disc’s extra appear via four featurettes. We find “Martin McDonagh’s Seven Psychopaths” (2:31), “Colin Farrell Is Marty” (1:25), “Woody Harrelson is Charlie” (1:24), and “Crazy Locations” (2:09). Across these, we hear from writer/director McDonagh, production designer David Wasco, cinematographer Ben Davis, producer Graham Broadbent, actors Farrell, Harrelson, Sam Rockwell, Abbie Cornish, and Christopher Walken. The clips look at story/character subjects, cast and performances, sets, location and visual design. These are essentially promotional pieces, so they don’t tell us much about the production. The disc opens with an ad for 7500. That clip also shows up under Previews along with promos for Faster and The Mechanic. No trailer for Psychopaths appears here, though two odd ads do pop up via Seven Psychocats (1:31) and Layers (1:05). The first reworks the film’s trailer starring felines, and the second takes movie clips and makes them into an odd music video. “Psychocats” is the more amusing of the two. While its promos may lead audiences to expect a wild Tarantino-style ride, Seven Psychopaths instead prefers the Charlie Kaufman route of self-referential action. This has potential – and the movie occasionally satisfies – but it’s too uneven to really succeed. The Blu-ray boasts excellent visuals and good audio but skimps on supplements. There’s enough meat here for me to recommend a rental, but that’s about it.